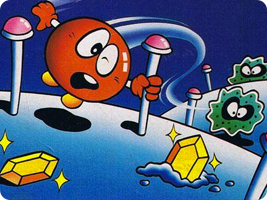 One of Nintendo's early Famicom games, Clu Clu Land is an early example of innovative controls. The hero, Bubbles, can only travel in a straight line. Only by bouncing off walls or using the Control Pad to stick out her arms and grab the Turning Posts are you able to change direction. The game's unusual name is thanks to a romanization of the Japanese word "kurukuru", which means roughly "round and round".